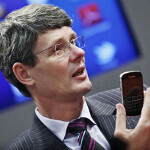 For RIM CEO Thorsten Heins, denial isn't just a river in Egypt. Yesterday we told you how the executive said that there was nothing wrong with RIM. Of course, thousands of investors who have taken the stock from $140 to single digits over the last 5 years might think otherwise. And Mr. Heins continued his apparent disconnect with reality by saying that the delay of BlackBerry 10 OS is a good thing for RIM. The executive based this on the thought that had RIM launched the pair of BlackBerry 10 handsets in the fourth quarter, it would have had to compete with other handsets brought out during the holiday season. According to RIM's top executive, It's a time when flagship devices are battling with each other to be seen. "Carriers really do strong launches in the first quarter," he said. Talking to Canadian Broadcasting, Heins said that carriers want a viable third option after iOS and Android, and he says there is no reason why BlackBerry can't be this third option. Hmmm. It would seem that a little company named Microsoft might want to have a say in the matter. The question is whether RIM can even survive long enough to be around for Q1 launch. That is what is on the mind of S&P equity analyst James Moorman, who says he is concerned about "device demand" before the launch of BB10. While RIM will have nothing new to rollout for the remainder of the year as it girds its loins toward the release of BlackBerry 10, globally the company is doing much better than in North America. In emerging markets, entry level BlackBerry models remain popular and gives the company the opportunity to update users to BlackBerry 7 devices. Heins believes BlackBerry 7 is just as competitive as the other top platforms in the market. RIM's CEO talked about RIM's loyal customer base, its 80 million subscribers, and the two new BlackBerry 10 handsets coming out, one with a physical QWERTY keyboard. But the executive did say that RIM has had to concentrate on touchscreen devices with virtual keyboards for the new OS because growth of handsets with physical QWERTY keyboards has flattened out. 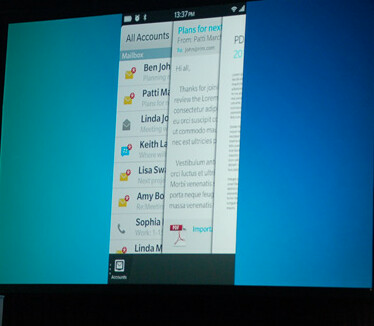 Returning to BlackBerry 10, Heins says that RIM will be using ads to help show the public what the QNX based OS can do. He took a shot at RIM's challenger for the third spot in the OS Wars by calling Windows Phone "confusing" because of the different versions of the software. because you can pay lumia for crapberry on your chest? Windows 8 will roll out in October November along with Windows Phone 7's final chapter. Windows Phone 8 may even be available before 1Q 2013. This will give real credibility to MS... Does Microsoft have a chance to take the third slot? Has it already? I thought we should expect WP8 devices from the MS OEM's by 4Q12, well in time for the holiday season. Who cares if it is not a relevant option? I do. I like BB OS. I'm not like you whos world revolves with anything android. I agree. More competition, more choices, better deals. I hope BB10 is a success. This delay will kill them, period. Yes, IMHO they should split the compnay to 1) focus on the BB services roll out across multiple ecosystems and 2) run the rest of the handset company like a cash cow. better to be late and successful than to release early and be half witted. If Heins does not think BB10 can compete with other OS' flagship devices in Q4 2012, what makes him think it can compete with the same devices in Q1 2013? And what is confusing about WP 7 / 7.5 / 7.8 / WP 8? Isn't that equivalent to BB 5 / 6 / 7 / BB10? I am confused! Blackberry fall off the RIM. BlackBerry Messenger isn't better than any other messenger. BlackBerry's power is currently just in there. I have no reason to use BBM, as it's more expensive, while WhatsApp, Line, Yahoo Messenger, and a lot more is free and/or cheaper and can be used with any powerful OS like iOS, WP, and Android. I must admit i do not see the point of such scorn towards RIM in this article. Sure, they have significant challenges ahead as well as heavy competition to show that they can still offer a compelling option to others. However, as was illustrated they are still selling internationally quite well and are the first choice in many cases. Since the US is not the only market, though it is very important, RIM would for the moment end up much in the same position that Nokia was in for many years (that is selling internationally everywhere while having no identity in the US). 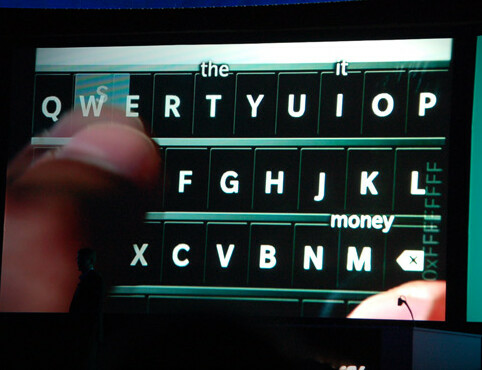 And if they successfully bring forth BB10 a return to the US market will change their fortunes. Bottom line is that I would not count such a company out too quickly as they may not be Microsoft but they are certainly no Palm. I agree with him. Launching with an incomplete OS can mean big trouble. It happened to the Playbook and gave it a bad rep even though the problems at launch no longer exist on it.